For bowhunters wanting a smooth draw and pleasant shooting experience, the Darton Spectra-e is a great choice. The Darton tagline for its 3800 series bows was “A Muscle Bow With Manners.” As a longtime fan of Rex Darlington’s designs, especially that 3800 series, I’ve been curious for several years to see what would follow that series and whether or not it could be improved upon. Last year’s Maverick II, featuring a new riser and limbs but sharing many other technologies of the 3800 bows and boasting a similar performance, naturally invited comparison. In terms of performance and shootability, I found the distinctions to be subtle. The cable guard of the Spectra-e is slightly modified from previous models, but other features are unchanged, including premium Darton-built strings and cables (with a few extra speed nocks) the string stop and limb dampeners. Beauty is of course in the eye of the beholder, but Darton’s hunting bows have always struck me as good-looking bows, aggressive in appearance without being radically different. The test model was finished in Kryptec Typhon, which I’m partial to. Fit and finish was what you’d expect in a flagship bow: plenty durable and flawless. Draw weight of the test model maxed out at slightly over 70 pounds, which I adjusted down to 70. The set screws and limb bolts were pleasantly snug and turned without slipping, sticking or chattering, and without recourse to a vice or pliers. Standard test accessories were installed without difficulty. One item I miss from the later 3800 bows is an index line on the shelf that helped with horizontal rest adjustment, but that sort of aid is probably more important to someone who is tuning bows on an almost daily basis than it is to most bowhunters. In any case, the bow tuned easily and required only a few minor tweaks after eyeballing the setup. At 4.2 pounds, the Spectra-e might fairly be labeled as a medium-weight bow. The grip is very comfortable and, for a side-plate-style grip, should be warmer than most in cold weather. It is a little wider than some shooters might prefer; a slimmer, slicker grip is available as an option. The published speed of 330-335 fps gives up 10-15 fps compared to the 3800 and the Maverick II speeds, presumably in order to achieve more shootability — a tall order given the high degree of shootability for which recent Darton models are known. In fact, the Spectra-e’s draw force curve confirms a more gradual climb to peak weight and is generally more rounded. Subjectively, I would say the feel is very similar to that of the previously mentioned bows. It is noticeably, if subtly, smoother drawing. There is little to no vibration at the shot. The high letoff makes it an easy hold at full draw, and it is certainly steady. The valley is very comfortable, and the back wall is rock solid thanks to the limb stops. The stops are removable, and since I’m among those shooters who feel they can draw through the shot more consistently with cable stops alone, I removed the limb stops. No doubt the Spectra-e takes a slightly different direction than recent Darton hunting bows. Shooters looking for a new Darton bow, and for whom the speed-to-shootability ratio achieved by the Dual-Synch cams and other Darton technologies approached perfection, will probably opt for the 2018 Maverick II. 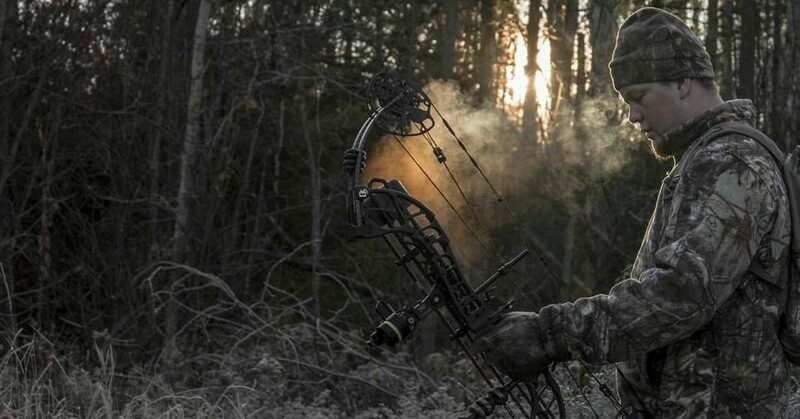 At the same time, 330-335 fps is respectably fast and, as many a bowhunter has pointed out over many a campfire, the deer don’t know the difference. For the growing number of bowhunters for whom the smoothest draw and the most generally pleasant shooting experience is paramount, the Spectra-e is a great choice. For Darton Archery, the bow is clearly a win, and will help expand the company’s appeal to a broader range of bowhunters. For more information, visit www.dartonarchery.com.